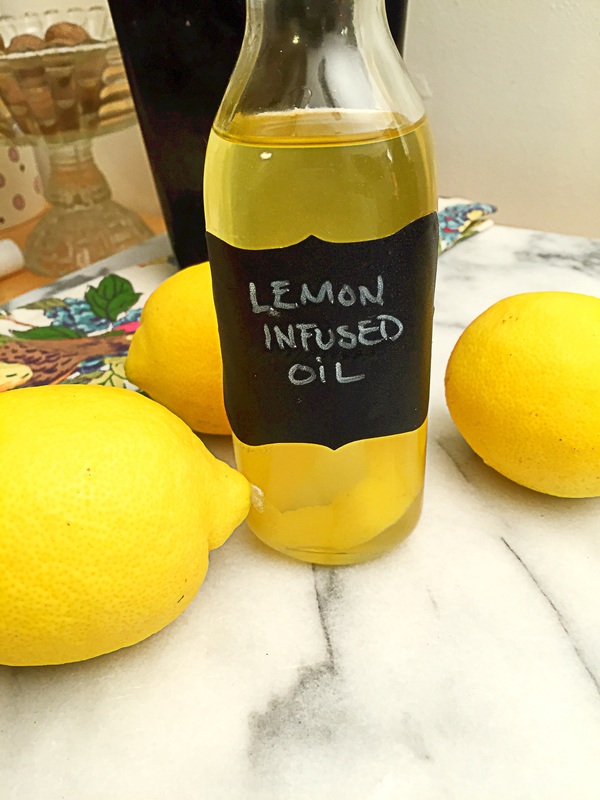 I’ve always wanted to try my hand at making infused oils. I buy them all the time, but they are a little on the expensive side, so making my own seems like the better value. 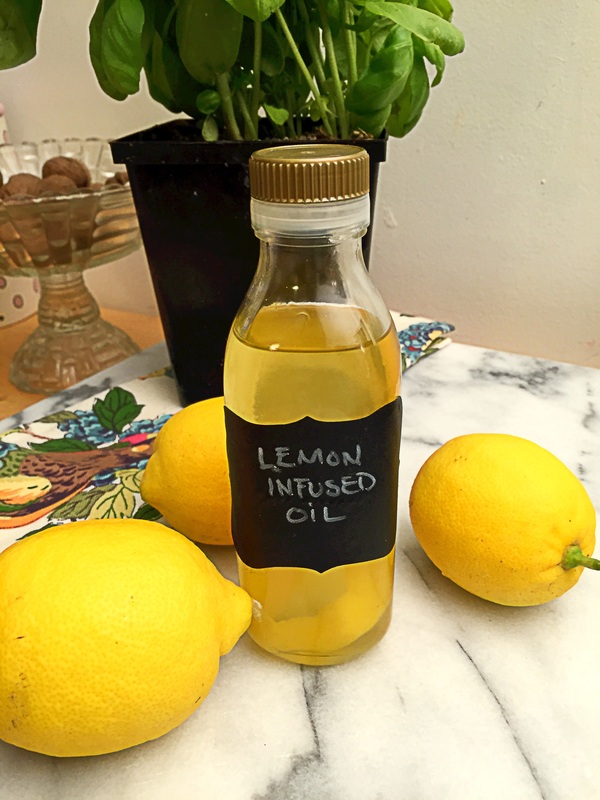 Infused oils are a great way to layer flavor in almost anything, be it a salad, warm or cold, or as a highlight to fish, potatoes or a finish to a hummus. 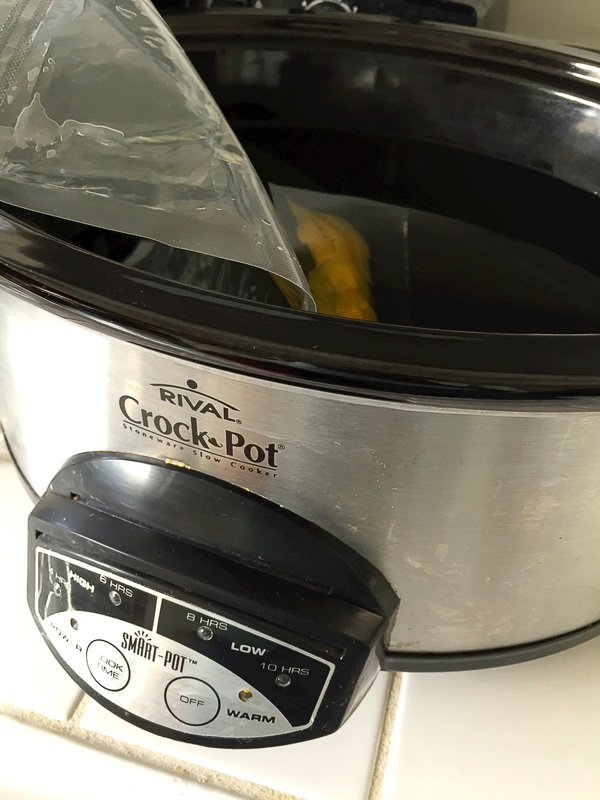 The process is super simple–especially if you use a slow cooker or a immersion circulator. I had originally planned to make this with my immersion circulator, but I didn’t want to exclude a lot of you from making it. So I borrowed my mom’s crock pot, so that I could adapt this recipe to fit the needs of a slow cooker. 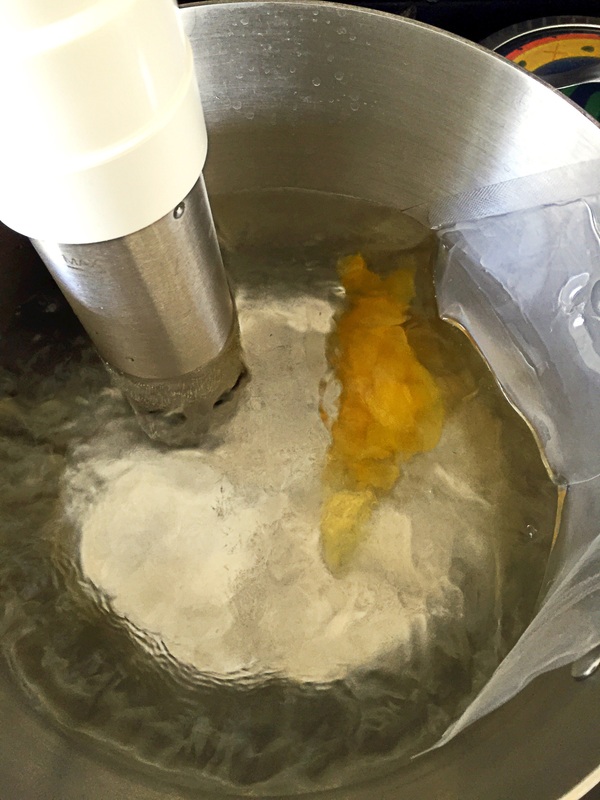 Sous vide and slower cookers have a lot in common, both cook food at low temperatures. Immersion circulators offer the option of cooking at even lower temperatures than slow cookers. If you have a slow cooker that has the option of allowing you to set exact temperatures then you’re ahead of the game. 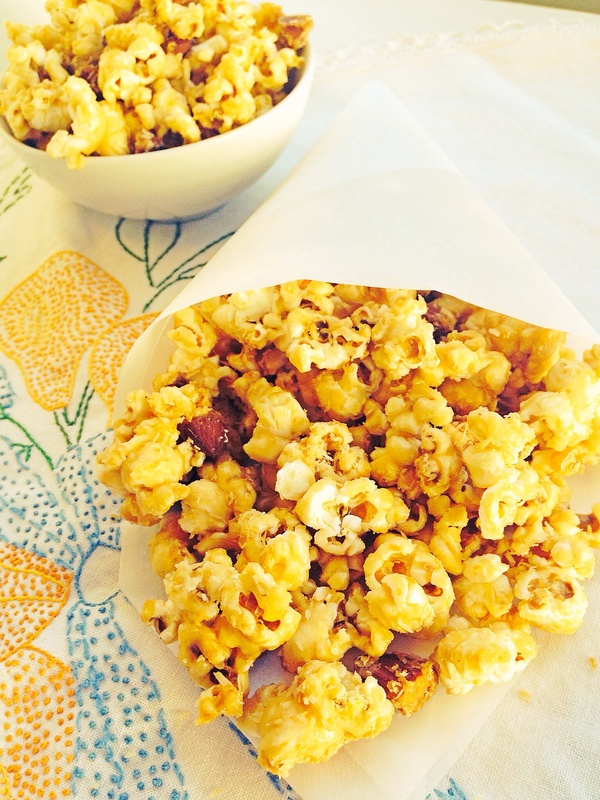 If your slow cooker only has a low, medium, high, or warming settings, don’t fret, you can make this. My mom’s slow cooker has a high, low and warm setting. I went online and did some research on what exactly those setting are and found out that the low temperature setting on slow cookers is 200F, the high is 300F and warm is 145-165F. I planned to set my circulator to 131F for 3 hours for this recipe, so the warm setting on my mom’s slow cooker was more than sufficient to match that. In fact it was sufficient enough to allow me to shave off a few minutes from the 3 hour cook time. I did not, because I was busy doing other things while the oil was in the slow cooker, but if you’re anxious, you could take 15 minutes off of the cook time. 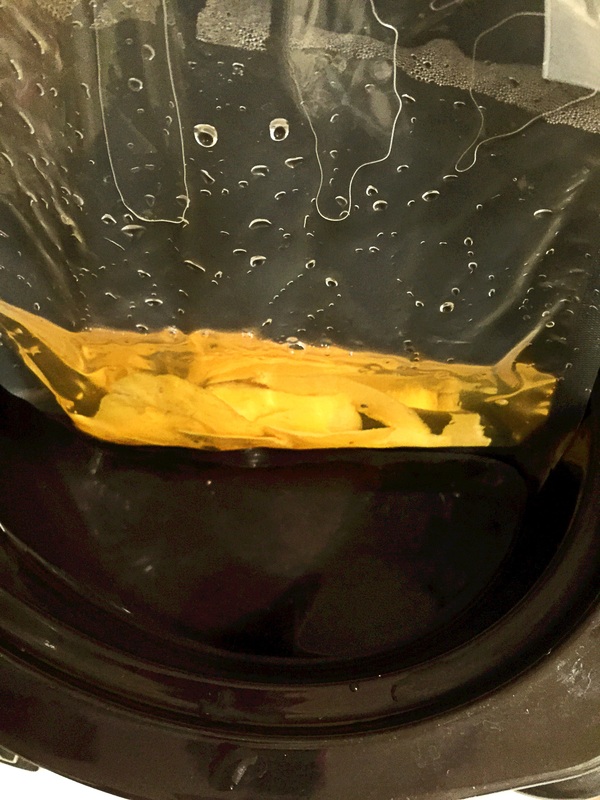 I made this lemon infused oil in both my immersion circulator and my moms slow cooker–set a timer for 3 hours for both. The results were identical. The lemon was nicely infused in both oils. 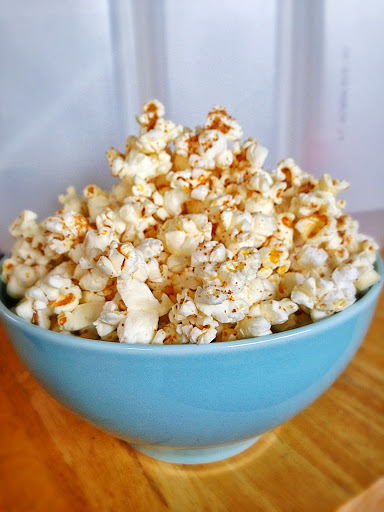 I used avocado oil, but this can be done with olive oil, grape seed oil, or any oil that you choose. Directions for slow cooker: fill slow cooker with water and set to 131F,–if your slow cooker has an exact temperature setting– or set it on the warm setting–low if your pot doesn’t have a keep warm setting. 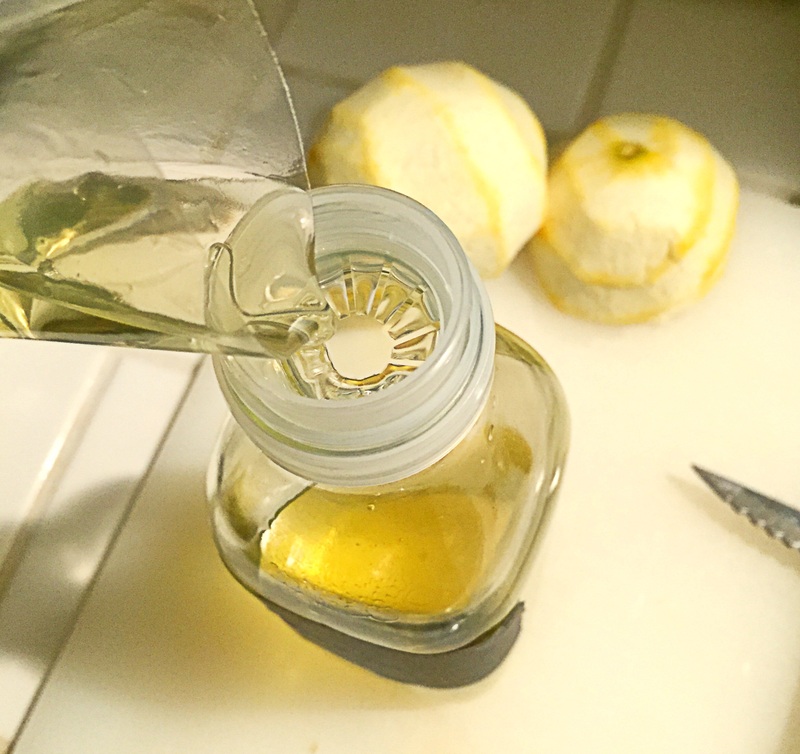 Place oil in a bag, then add lemon peels–making sure to bend and twist them to release oils. 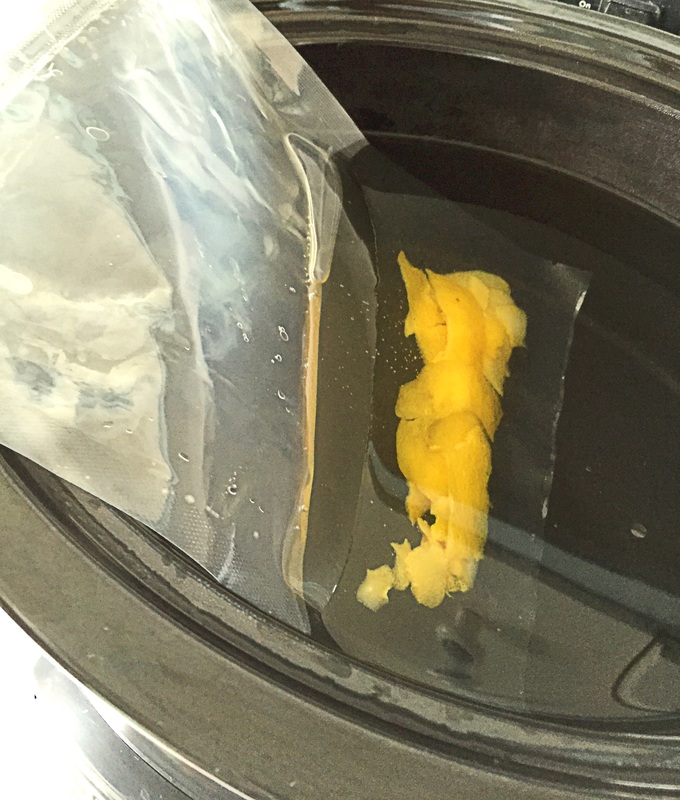 If you’re using a ziploc bag place the bag in the slow cooker and seal using the water displacement method, then cook for 3 hours. 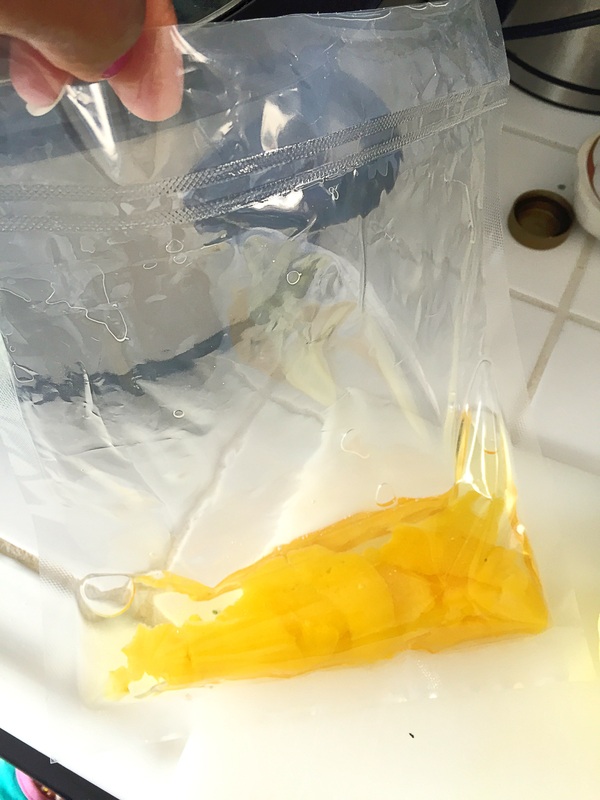 If you have a vacuum chamber sealer that allows you to seal liquids like I do, then seal the oil and lemon mixture in a bag for 10 seconds with a 1.5 second seal. 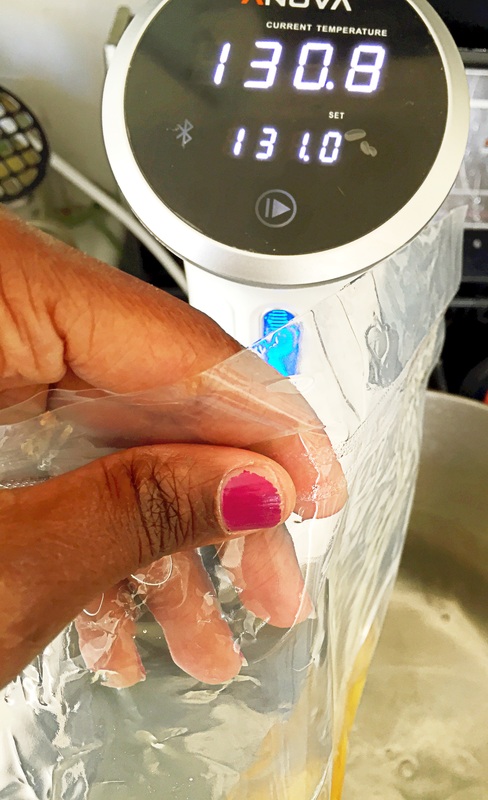 Directions for Sous vide: Fill a pot or container with water, then set the circulator to 131F and wait for the water to come to temperature. 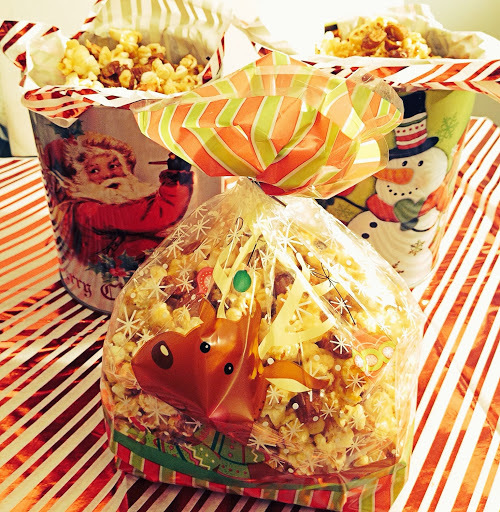 Meanwhile add the oil and lemon peels to a bag–making sure to bend and twist them to release oils. If you’re using a ziploc bag place the bag in the water bath and seal using the water displacement method, then cook for 3 hours. 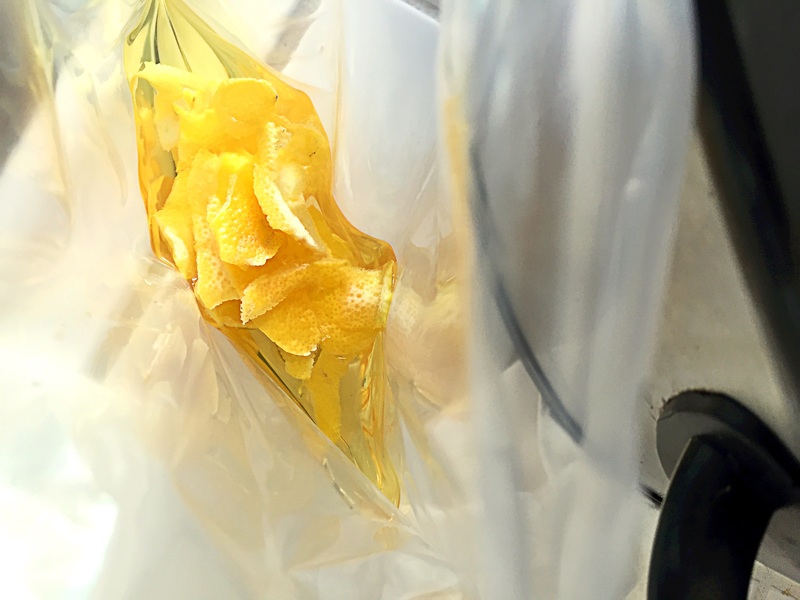 If you have a vacuum chamber sealer that allows you to seal liquids like I do, then seal the oil and lemon mixture in a bag for 10 seconds with a 1.5 second seal. 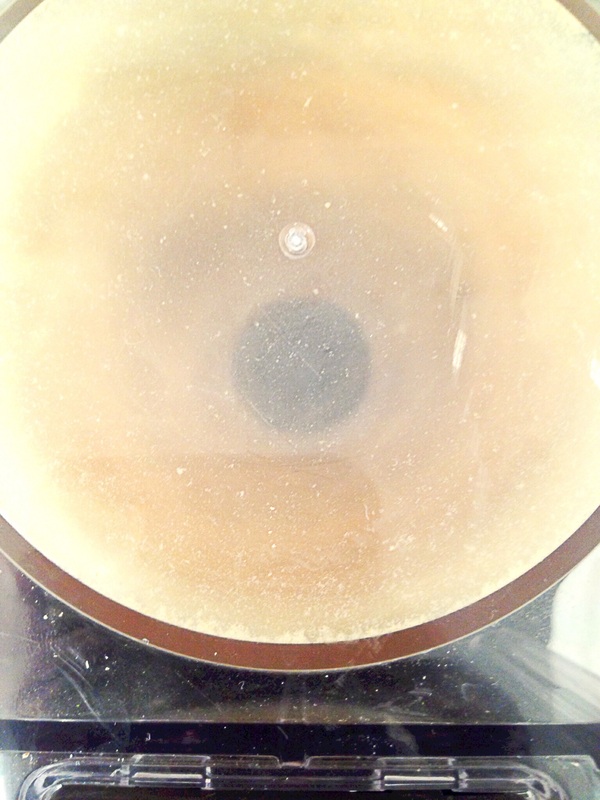 At the 3 hour mark, carefully remove the oil from the water–remembering that even at 131F-165F water is very hot. Transfer the oil to a clean container–removing all of the peels–you can leave one or two for decoration if you’d like. 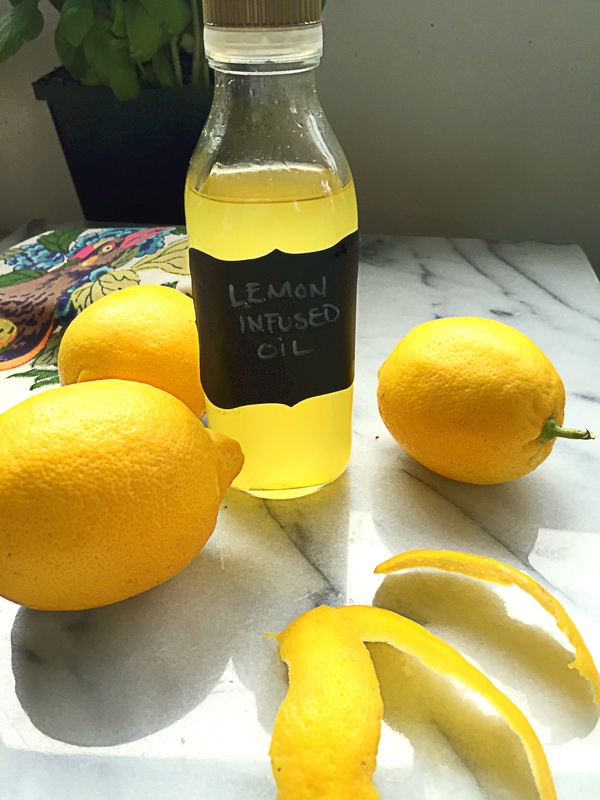 The lemon oil is ready to use. There are so many uses for this oil. Drizzle a little on avocado toast, or on roast chicken–the uses are endless and always delicious! This blog has been a year in the making. Sour salts and the use of sour salts first caught my attention after reading an article in Bon Appetite Magazine about how the chef at State Bird Provisions was using sour salts to brighten up dishes, and make use of an ingredients that would otherwise not get used. 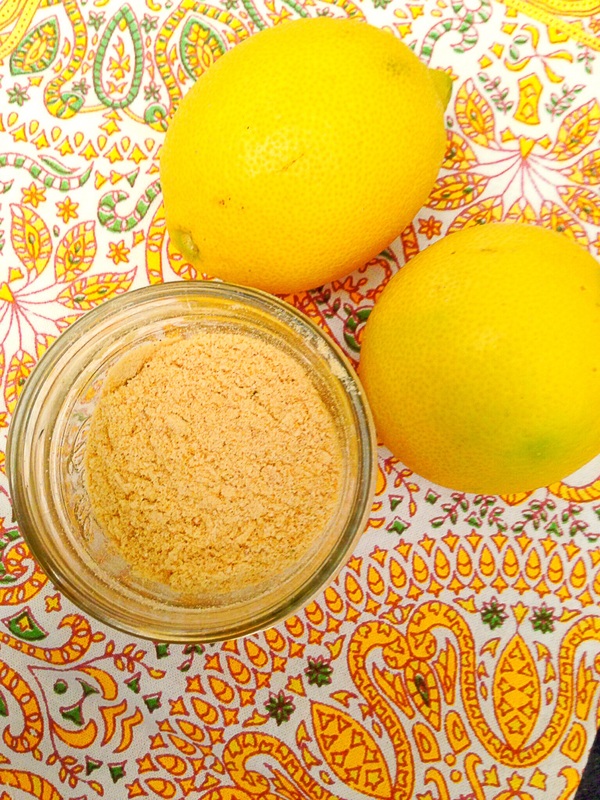 His approach was simple, dehydrate something as simple as a preserved lemon, grind it into a powder, and boom you’ve created a flavorful salt without even trying. 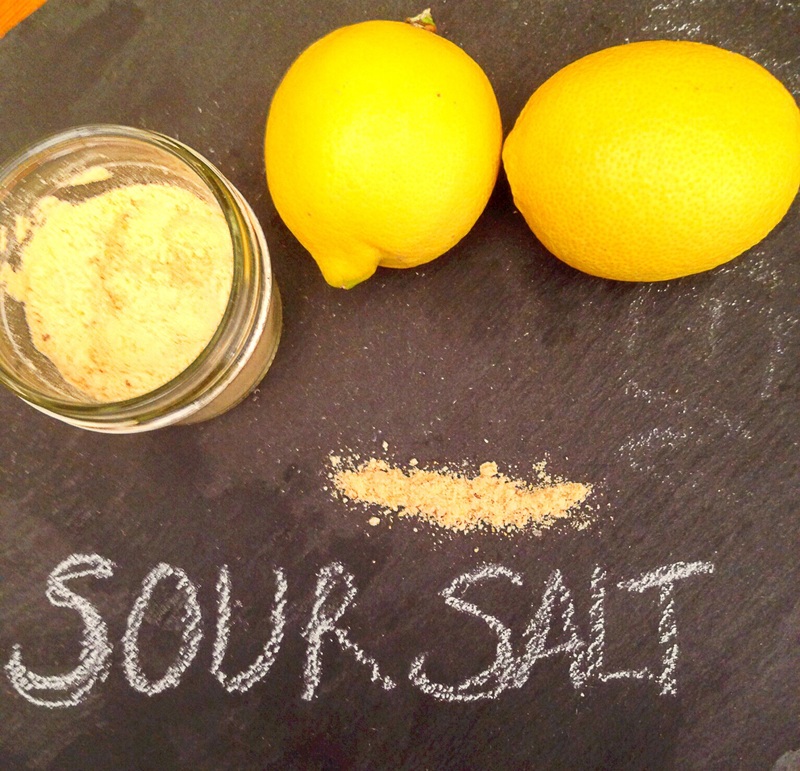 After reading that article, I knew that I wanted to try making a preserved lemon salt. 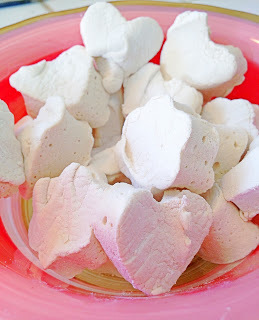 I put it on my list of things to blog about, but never got around to it–it has been almost a year since I read that article! 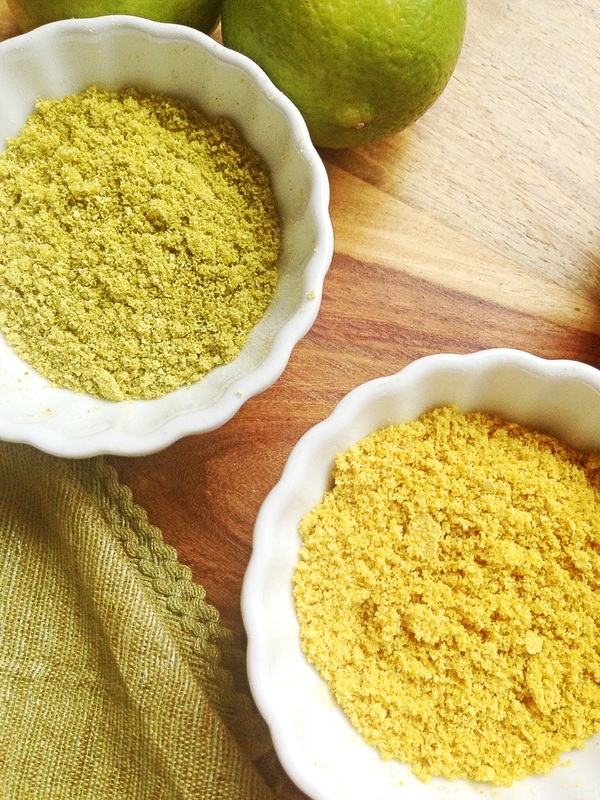 Of all the sour salts I have on my list to make, the preserved lemon sour salt has always intrigued me the most–that and a lime pickle salt–I love a good lime pickle! My first thought was to make my own preserved lemons and lime pickle. 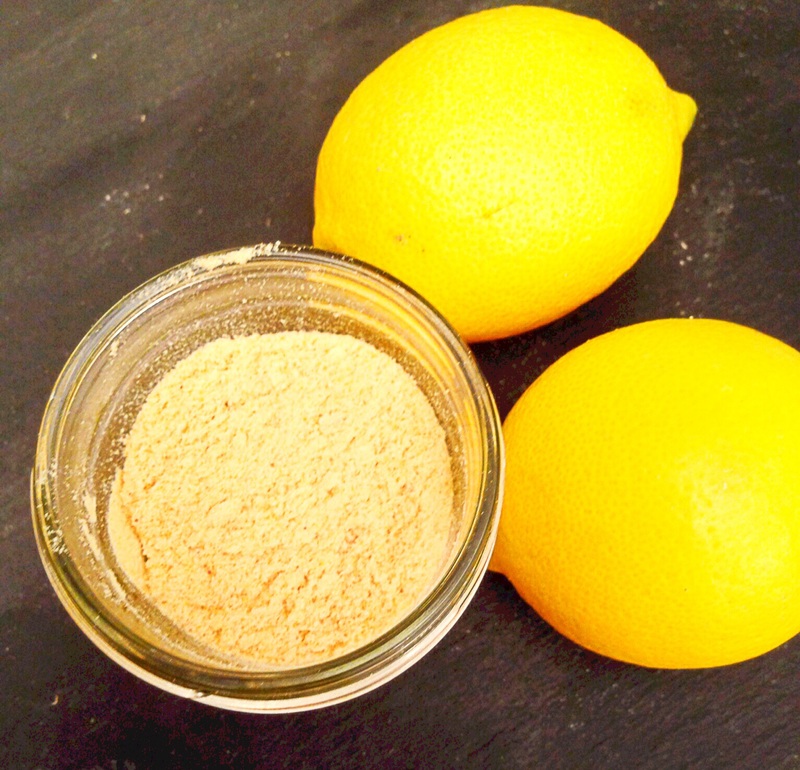 But rather than make you all–and myself wait for me to make a preserved lemon, which would further prolong me making this sour salt, I thought I’d just skip ahead a few steps and buy some preserved lemon’s from my local Whole Foods. Christmas is just a few weeks away, and since I’m giving these salts away as gifts I cant wait to make preserved lemons from scratch. Makes about 4 ounces of sour salt. Directions: Pre-heat oven to 150F if using an oven. If using a dehydrator set it to 135F. 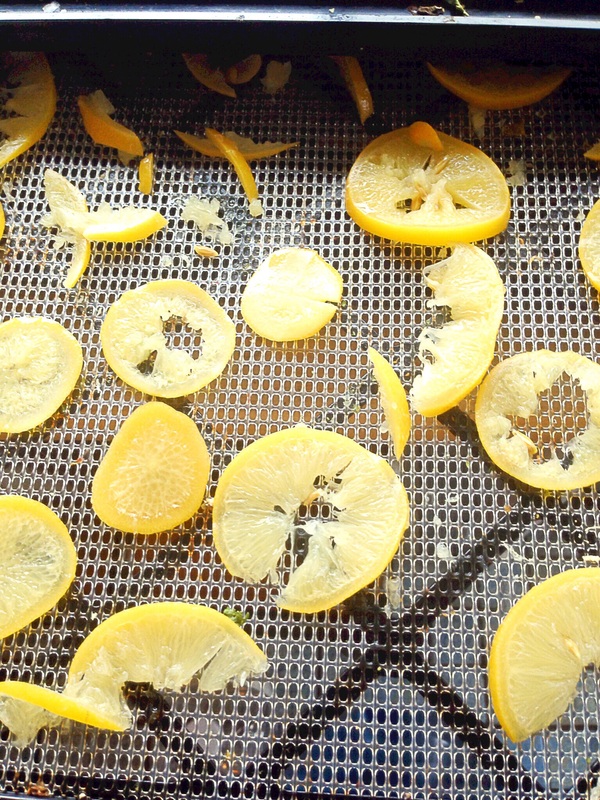 Place preserved lemon slices evenly onto your dehydrator sheets, if using a stove, spread over a wire rack set inside of a bake sheet. Transfer the powder to an air tight container. You’ve just created a gourmet salt. You can sprinkle this on chicken, and fish. Add it to my North African Lamb Stew, or to some grilled lamb chops, the possibilities are endless.